Sous la selle de sa propriétaire Tracy Scheriff-Muser. 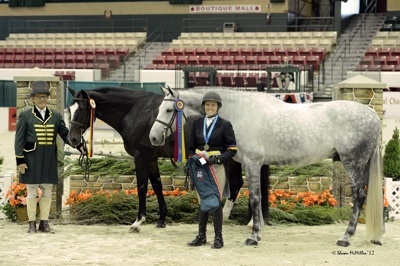 In the Amateur-Owner 3’6” Hunter 18-35 division, sponsored by The Hallman Family and MerryLegs South, Tracy Scheriff-Muser of Wellington, FL, swept the tricolor presentations. She and Absolut were named champions, while Macallan took the reserve champion ribbon. Absolut finished first and second over fences, second in the stake, and third in the under saddle. Macallan placed first and third over fences and was fifth in the under saddle". Capital Challenge est une finale très importante "in door" qui rassemble les meilleurs cavaliers américains après sélections sur 10 jours de concours.